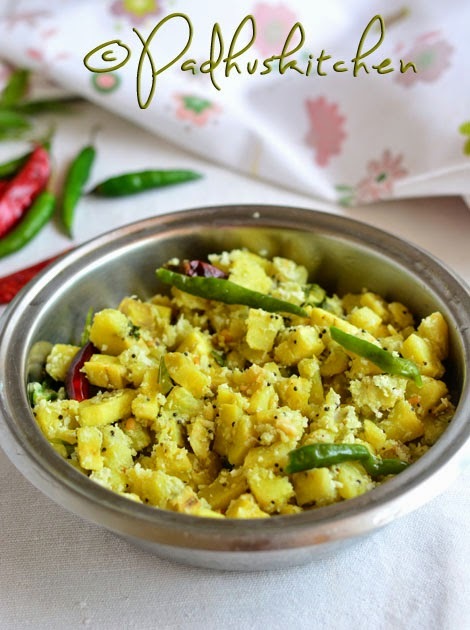 This is a very simple Tamil Brahmin recipe without onion and garlic. It is prepared with very less oil and is very healthy compared to the vazhakkai fry. It goes very well with rasam and sambar rice and is commonly served in marriages. Today we will learn how to make vazhakkai thengai curry following this easy recipe. Peel the skin of plantain and chop it into cubes or medium sized pieces. Keep it in water to prevent discoloration. Delicious, easy and healthy plantain stir fry is ready to be served with rice. Note - As raw plantain might cause stomach discomfort for some people, I have added hing and ginger. So do not omit that when preparing this curry. Check out my another version of Plantain curry using chilli powder and vegetable curry podi. I just love a healthy, good dish. Such a clean and easy recipe! Such a simple and nice presentation. So many thanks to you.